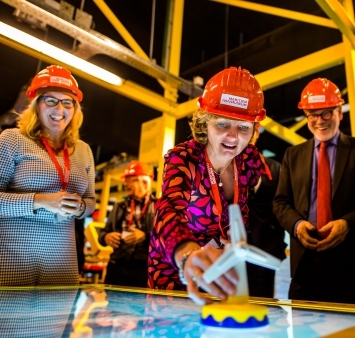 Marjan van Loon, President-Director of Shell Netherlands, officially opened the Offshore Experience exhibition at the Maritime Museum in Rotterdam on Friday, 16 December. The Offshore Experience is the first exhibition in the Netherlands on the offshore sector. During the experience, visitors feel as though they are in open sea, up to 3 kilometres below the surface. Over fifty leading companies in the shipping and offshore maritime sector are among those who have helped fund the first-ever exhibition in the Netherlands dedicated to the offshore sector. The Offshore Experience is open to the public from 17 December. Smulders is one of the proud partners of the Offshore Experience.